It was December in Berkeley and I was just finishing up with another intense semester when I came across NOAA's list of geothermal springs in the United States. One of my favorite things to do is to go out and find little-known but interesting places and things near my home or out in the mountains or desert, and hot springs suited this description quite well. One of the first things I did when I got home for winter break was to go out and find San Juan Hotsprings. After that, I left on a thousand-mile roadtrip to the desert and to San Luis Obispo, visiting a few springs along the way. 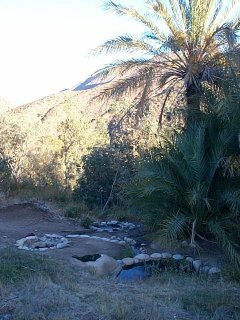 What amazes me about the San Juan Hotsprings is how little-known they are. At some point in the not-so-distant past the springs were the site of a commercial resort and the community of San Juan Hotsprings. At present, the community is reduced to three residences and the ruins of many other structures which were obviously burned down some time ago and are now overgrown. The rest of the story is told here. The sunday after christmas I studied the AAA California map and was inspired to take a trip. I called my friend John. "Let's go on a trip tomorrow," I announced. John thought it sounded like a fine idea, so we agreed to meet at the unnaturally early hour of 9:00 am. I called Eric too, but he was not home. We called him in the morning, and abducted him on the way out. By chance, Eric got "shotgun" and the maps, so it was up to him to navigate on our expedition which did not yet have destination. He put his finger down in the Eastern sierra, so that was where we were to go, taking the five to the ninety-one, to Interstate 15, and finally to U.S. 395 through the metropoli of Victorville, Boron, Inyokern, and Olancha, cruising at 55 in my family's VW vanagon. Ahead on the map we saw Dirty Socks Hotspring; deciding to check it out, we turned onto State Route 190 and began navigating through the dark primarily via GPS. Dirty Sock hotspring, located just off CA-190 about 5 miles from the junction with US-395, is about as exciting as its name implies. The springs arise in a large circular pool punctuated by an enigmatic monolith of concrete dropped into the center. The slime in the stagnant 90oF water coupled with the trash on the periphery made the spring itself unappealing to our group. 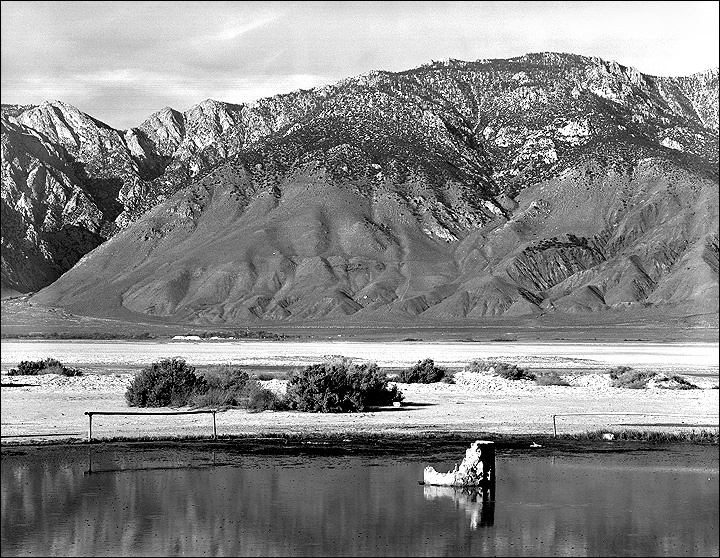 However, in the Owens valley, one can never escape the striking beauty of the desert. It was dark when we arrived -- the sun sets much too early in the winter -- and cold, and we were hungry. We set up the propane coleman stove in the VW and cooked up a batch of Ramen noodles, mixing a toxic potpourri of flavor packets into the brew. We'd left the middle seat of the van at home, so there was quite a bit of floorspace. The propane stove heated up the van in a hurry, but we were careful to not axphyxiate ourselves. Black and white photo of Dirty Sock in the wintertime by Hamish Reid. Color photo of Dirty Sock ("call 911") also by Hamish. Having eaten we were ready for more adventure. We decided to check out the Coso hot springs -- the area looked to be a real gem, with fumaroles and the works. We set out, backtracking twenty miles to Coso. The first road we tried was the wrong one, but the second one was obviously correct. I wondered why the road was so wide -- after all, it just went out into the desert. All of the sudden our headlights lit up razorfence and a sentry kiosk. While John panicked, Eric and I consulted the map and wondered why we had not noticed the dashed boundary of China Lake Naval Weapons Center earlier in the evening. Further research reveals that the Navy has developed a geothermal power plant there, and maintains a webpage on the subject. The Naval Air Warfare Center Weapons Division webpage tells about some of the stuff that goes on at this facility. That night we camped at Dirty Sock Hotspring, on the floor of the volkswagen. Eric and I are about 6'2" tall, but a VW vanagon is not quite that wide. Thus, we spent the night iterating between the infinite variety of uncomfortable contorsions possible in that confined space. It was also cold -- no surprise here, it being winter in the Owen's Valley -- with the temperature falling to 25oF. This in and of itself would not have been bad at all, but coupled with the awkward positions, sleeping proved difficult at best until the sun rose. We should have just set up a tent, but neither Eric nor John had sleeping pads, and insulation from the ground is a must. In the morning the sun lit up the landscape and we were able to take in the beauty of the desert, and capture the above photograph of Dirty Socks spring. We set out again on a northward course. Thirty miles later we stopped in Lone Pine for breakfast/lunch at the Frosty Chalet. Our next waypoint was Keough Hot Springs, or rather, its sidekick affectionately refered to as the Kough Hot Ditch. Keough Hot Springs is a developed resort, but the overflow from their spring forms a small creek which flows east, over City of LA land, towards the highway. 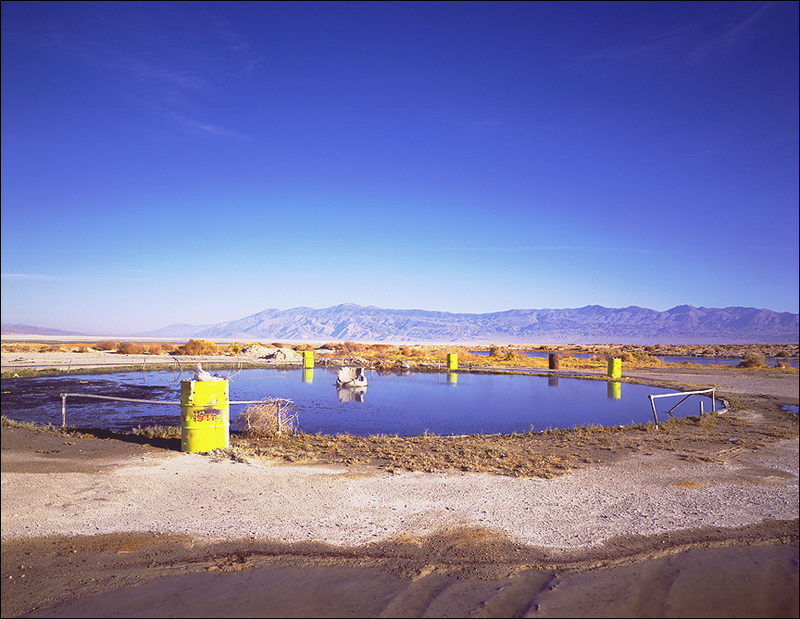 The City of Los Angeles owns much land in the owens valley, for the purpose of diverting water through aqueducts to the city. Fortunately the City allows the use of their Owens Valley lands (but forbids camping), so the public is free to trapse about and explore. At Keough, the water cascades through a series of pools, starting at about 110oF and going down to about 80oF in the popular area -- and the area is extremely popular.